A very excited bunch of kids from Te Aro School on Monday. They all asked the same thing as they came streaming through the door “Are we using the hockey sticks today?”. Well, the answer was supposed to be “No, we need to teach you crossovers” but they were so eager that we decided crossovers could wait another week! After the kids warmed up skating through a skills maze we got out the sticks and taught them how to pass and receive a puck. We finished with a great game of puck chase. Today we taught the kids from Roseneath School how to do a wrist shot. Not an easy skill to learn but they all gave it their best effort. 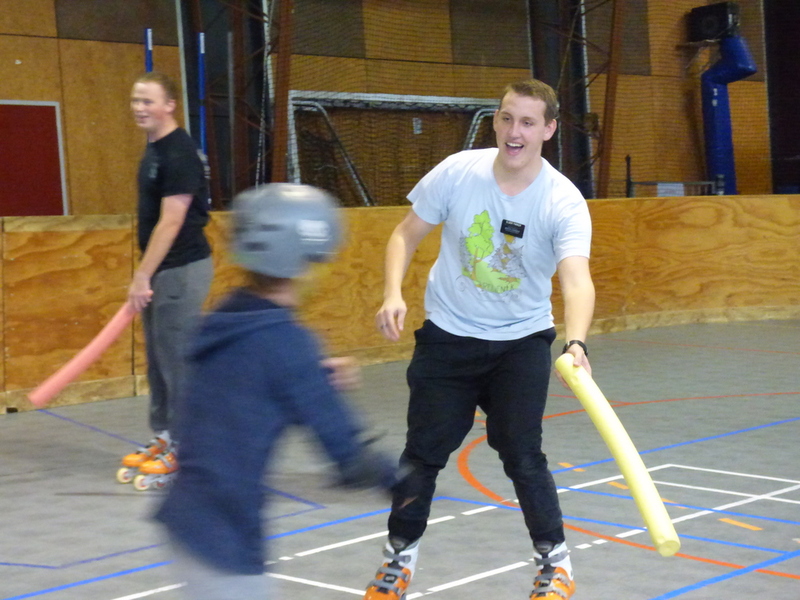 Sincere thanks to Parker, Sio, Levale, Clark and Harris, volunteers from The Church of Jesus Christ of Latter-day Saints, who have turned up four afternoons a week over the last two terms to help with Penguins SlapShot Hockey programme. To date that is a whopping 470 volunteer hours donated to our KiwiSport programme! Monday welcomed an excited group from Te Aro School for their second SlapShot lesson. 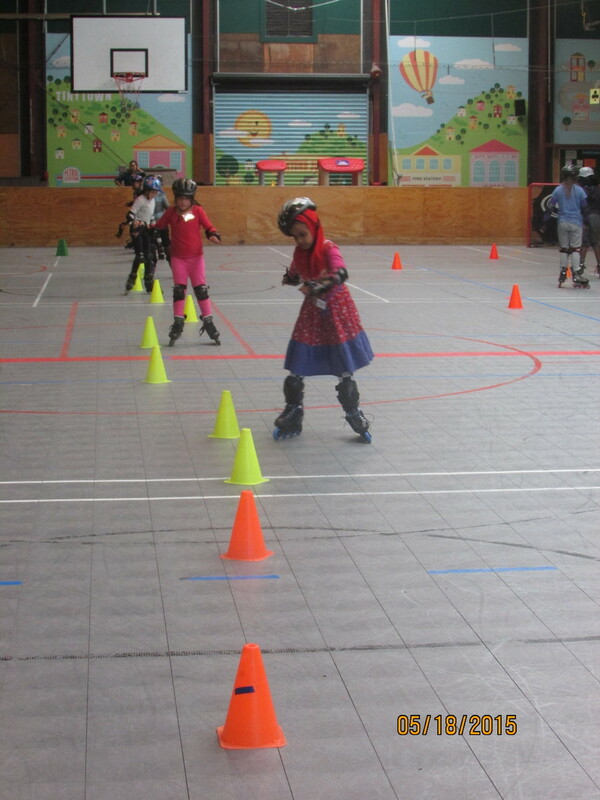 This week you practiced the skills learned in week one, then we added in some new fun ones like skating on five wheels and then four wheels! The highlight of course was torpedo alley! Miramar North kids turned up excited and late on Tuesday due to a bus breakdown but were soon geared up and ready to go. They certainly had a big day of activity having run their school cross country in the morning. 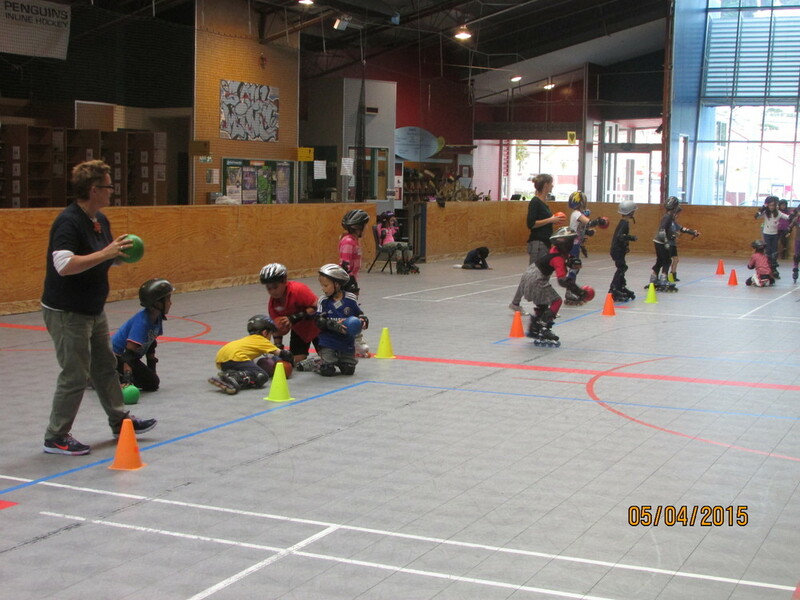 Look at these kids go – week three and so confident out in the middle of the rink! A good day for St Patrick’s Primary School kids to be inside skating today, bleak and windy outside. Thanks to the wonderful help from Parker, Sio, Levale and Clark we had the kids out on the rink in no time at all. Today’s lesson focused on learning how to turn. The highlight of the day of course was torpedo alley! So good to see you all having so much fun! Welcome back Roseneath School on Friday for for your second SlapShot lesson. Today was spent going over last weeks skills and drills and adding to them. Look at how awesome you are! The group who have come across SlapShot Hockey before are also doing well learning new drills and inline hockey skills from Jackson. Another fun session completed by a game of Torpedo Alley. Sadly no class for Te Aro School on Monday due to a public holiday. A bus packed with happy kids pulled up outside the rink on Tuesday afternoon. We could hear the excited voices coming up the path! What an enthusiastic group of children. We love the way you support and encourage each other. Your best accomplishment today?? Everybody independently skating around the rink. You were able to turn and drop when instructed. Well done! Most fun had? Definitely Torpedo Alley! So awesome to have our neighbours back at the rink learning SlapShot Hockey. These kids from St Patrick’s Primary School Kilbirnie have a super caring attitude towards each other. Many times we have heard them ask a friend if they needed help putting on their gear or stop to see if they are hurt when they fall and lend to hand to help them up. Today we practiced lots of skating drills – look what you can do on your skates! Congratulations on listening to Katie and Martini today – you earned “free skating”. So great to see you all skating independently around the rink. We finished with a great game of torpedo alley and a well earned rest. 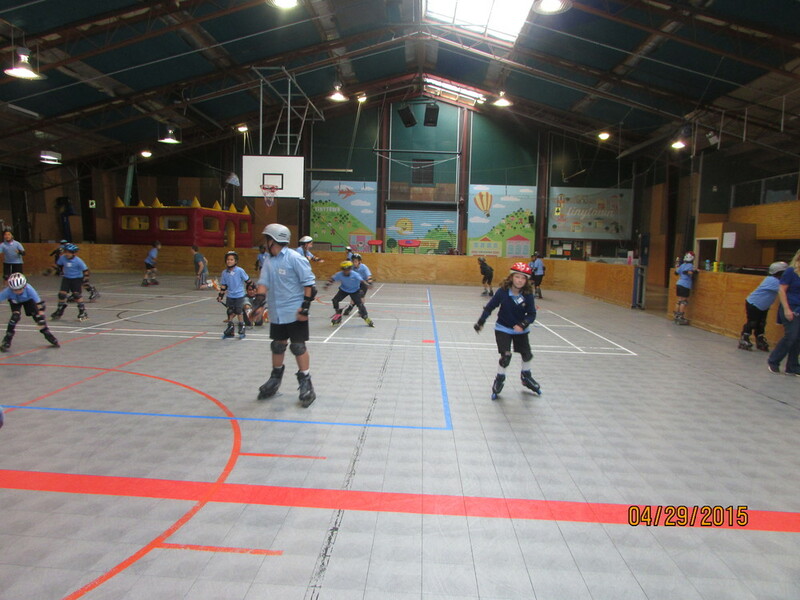 We welcomed Roseneath Primary School to SlapShot KiwiSport Hockey for the first time during school hours this year. So great to see Anne and her awesome class of kids back at the rink. A fantastic thing happened with this class – nearly half of them could already skate and/or play SlapShot Hockey. We divided the rink in half with the net curtain and ran two sessions today. The kids who are new to SlapShot worked very hard to learn new skills and within a few weeks we will have all the kids skating together as a team! Welcome to SlapShot Hockey kids from Te Aro, Miramar North and St Patrick’s Primary Schools. 150 new kids introduced to SlapShot Hockey on Monday, Tuesday & Wednesday this week. We hope you all had a lot of fun learning a whole new set of skills. 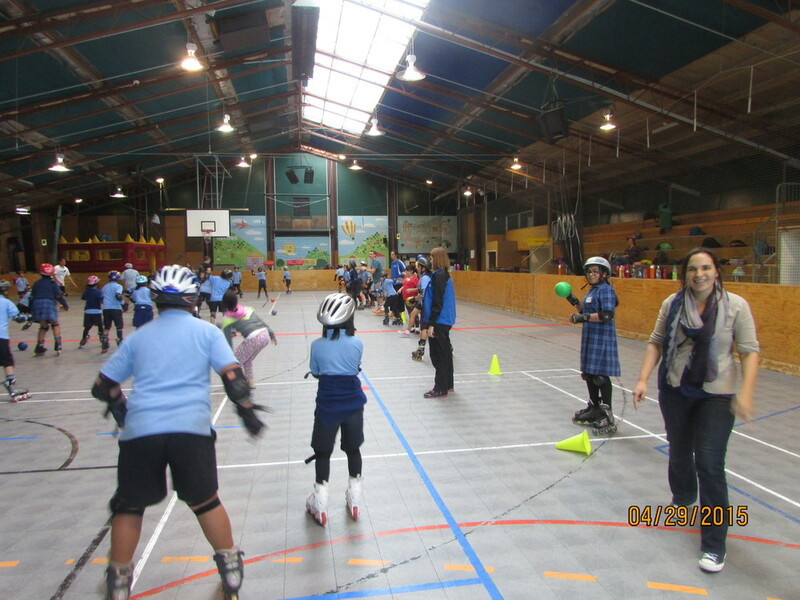 Te Aro School children learning to correctly put on their skates and safety gear. Our coaches Katie and Martini can’t wait to teach you how to play SlapShot Hockey! First though, we need to teach you a few basic skating techniques. Games will be a lot more fun when you know how to stop and fall correctly. Our first lesson is to learn how to fall onto our knees and how to stand up. You all did this so well, if not a little overzealous! By the end of the lesson you could fall on your knees without belly flopping on the floor or taking your weight on your hands and wrists. Well done!! The Duck Walk was our second lesson. 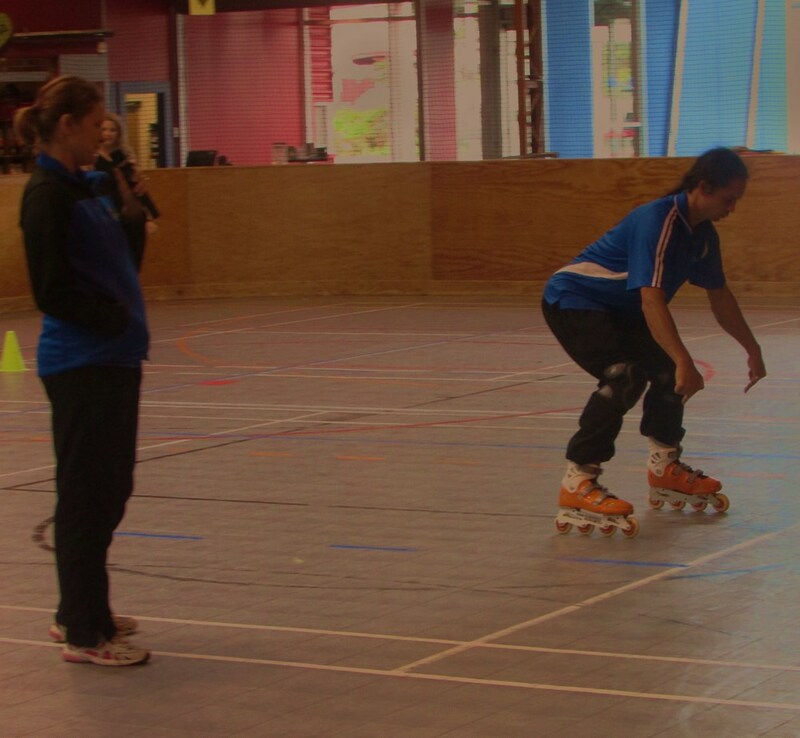 It looks a bit peculiar but is the basic stance of inline skating. Next you tried out the “coke bottle”. Skates stay on the ground and you push your legs in and out in the shape of a coke bottle. You were all amazing this week! We hope you enjoyed your lesson and look forward to seeing how you get on next week. Grateful thanks to all the volunteers who popped in this week to assist with putting on skates and safety gear. Today the kids learnt how to skate and shoot the puck. This is known as the “horse shoe” drill. Some great games of SlapShot Hockey today - the kids just love it when the coaches, teachers and volunteers join in! It looked like you were having heaps of fun today! We look forward to seeing you back next week for even more exciting games of hockey! 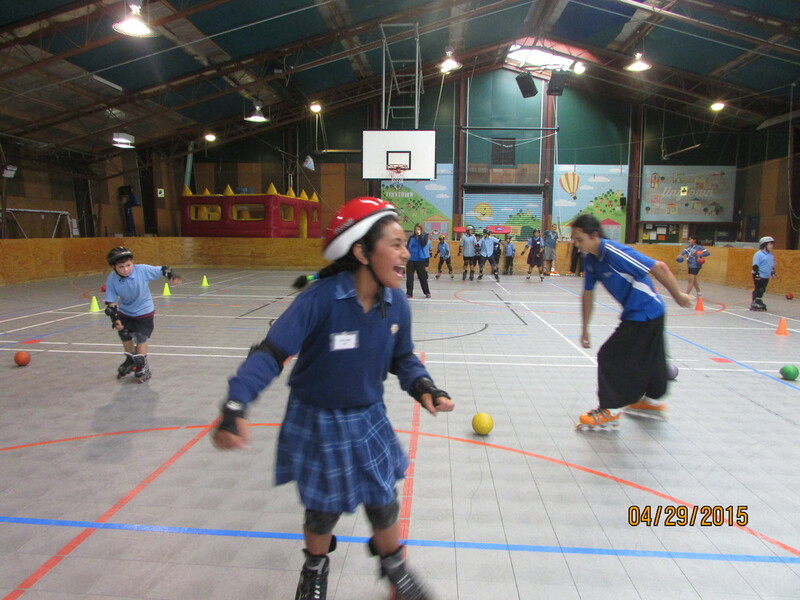 Wet and wild weather in Wellington couldn’t keep the kids from Thorndon School away today! Getting 60 kids out onto the rink in half an hour is always a good challenge although it has made a huge difference now the kids can put on their own safety gear. A great time was had by all the kids this week as they played their first games of SlapShot Hockey! SlapShot is to inline hockey what miniball is to basketball and flipperball to water polo. It is a simplified version of the game for beginners. The children wear basic safety equipment to enable them to get out onto the rink as fast as possible and maximise their hockey experience. Special thanks to the teachers for making SlapShot so much fun for the kids today! Thank you to all our wonderful coaches and volunteers. Thank you SlapShot Coaches and Volunteers! We are sad to say goodbye and hate to see you go. Remember all the fun we had and all the things we did but most of all remember - you are very special kids! Special thanks from Katie, Martini, Jackson & Nick (SlapShot coaches), Karen and Penguins Inline Hockey Club to all the parents who have walked to the rink with the children this term, helped with their safety gear and the running of the programme. You were invaluable - thank you so much! 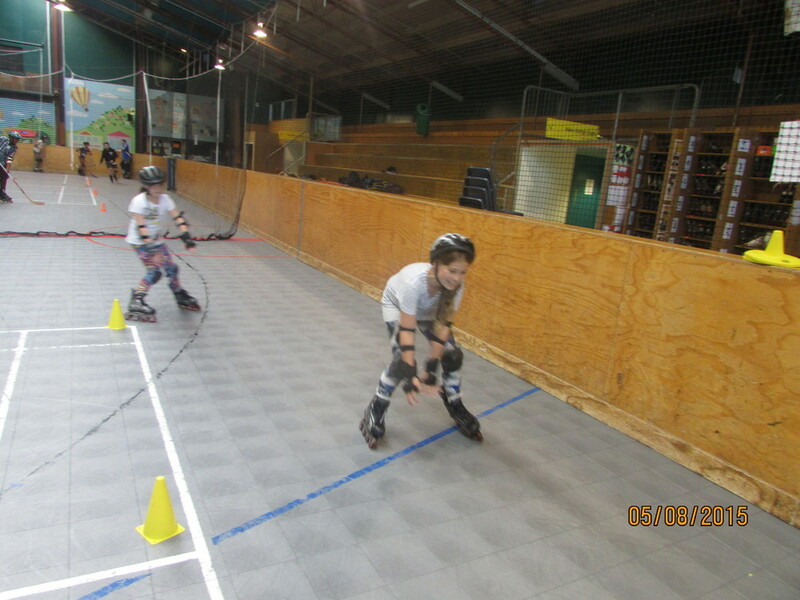 If you enjoyed playing SlapShot Hockey come along and join us on Thursdays during Term 1 at the Penguins Inline Hockey beginners session, 5.00 to 6.30 pm, Kilbirnie Recreation Centre. All gear provided. $5 per session. We hope to see you there! Term 2 - Thursday, 4.30 to 6.00 pm. All welcome! You have all achieved so much over the last five weeks. Your teaches and coaches are excited to see your confidence grow and the improvement in your skating. Playing SlapShot Hockey was the perfect way to finish your SlapShot experience - we hope you had fun! Friday skating skill session Lyall Bay School. Katie, Martini, Jackson, Nick and Karen look forward to seeing you back at the Kilbirnie Rink soon! We played hockey today and it was fun! You guys rock! Katie and Martini are looking forward to teaching you how to shoot goals next week. See you then! We hope you enjoyed your SlapShot lesson today Mt Cook School. Time just flew by! I was having so much fun with you all out on the rink that I did not take many photos so I have posted some from previous weeks – see if you can find yourself, you might be really pleased to see how much you have improved. Photos from week one (above) and week three (below). Next week we will be playing SlapShot Hockey! We hope the kids enjoyed themselves as much as we did! Puck tag - what an awesome game! Next week you will get to play your first games of SlapShot Hockey. We can't wait! 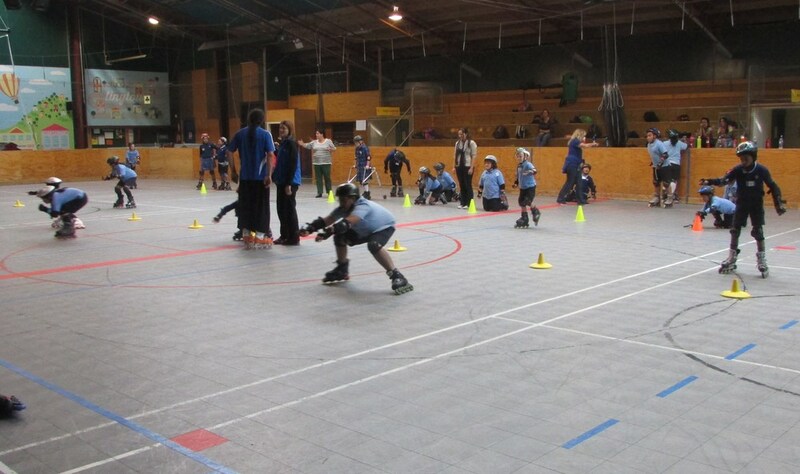 I can't believe we are already halfway through our Penguins KiwiSport SlapShot program for Term one 2015! Katie, Martini and Jackson are really excited to see how well all the children are doing. Every week they continue to amaze us with how quickly they pick up new skills. Kids, can you remember week one when you needed the wall to hold you up and to help you stop? Now you can skate and stop confidently and pass and receive a hockey puck! What dedication! Lyall Bay School children walked to the rink in the pouring rain for their SlapShot skating lesson today. Thank you teachers and parents for bringing the children in such wild conditions. Expert help from eight parents, teachers and four volunteers from The Church of Jesus Christ of Latter-day Saints enabled us to gear the kids up super fast. Martini and Jackson spent some time going over what the kids learnt last week, encouraging them to remember how to turn with the correct foot leading. Next up cross-overs, these kids are learning a lot of skills very quickly and were up to the challenge. The SlapShot team are really thrilled to see the kids now skating well enough to graduate to using the hockey sticks. Look how well you are doing. We finished an awesome afternoon with a game of Torpedo Alley. We hope you dried out after your drenching on the way to the rink – luckily the sun came out for the walk back to school. Another lovely sunny day for these great kids from Lyall Bay School to walk to the rink. Thank you to all the wonderful parents who have come along to help out over the past few weeks, your help has been greatly appreciated. We are really excited that you are getting to see the improvement in the children's skating ability as the weeks go by. The kids listened really well today! After a quick recap of the last few weeks and an introduction to crossovers and skating using crossovers we gave the children hockey sticks! Oh boy were they excited to finally get hold of a hockey stick! The four young men from the Church of Jesus Christ of Latter-day Saints who come along most days were a great help today handing out sticks and helping the kids with their safety gear. Thanks so much! Thank you Martini and Katie for another great lesson. We hope you had fun today and look forward to seeing you all next week. Wonderful listening today - we whizzed through the lesson plan which left plenty of time to play Torpedo Alley with the sticks and soft balls. It is so exciting to see the kid's hard work pay off - they can now skate well enough to use the sticks. We hope you had fun today and look forward to seeing you next week for fun filled games of Slap Shot Hockey! You were amazing today! Look at how good you are getting on your skates. After a recap of last week's lesson and learning some tricky new skills like crossovers, we finally got out the hockey sticks. We invented a new game this week - Torpedo Alley with hockey sticks and soft balls. We hope you had fun today Mt Cook School. Special thanks to your teachers, our two popular church volunteers and SlapShot coaches Martini and Katie. We look forward to seeing your smiling faces next week! You all worked hard and learnt new skating skills. 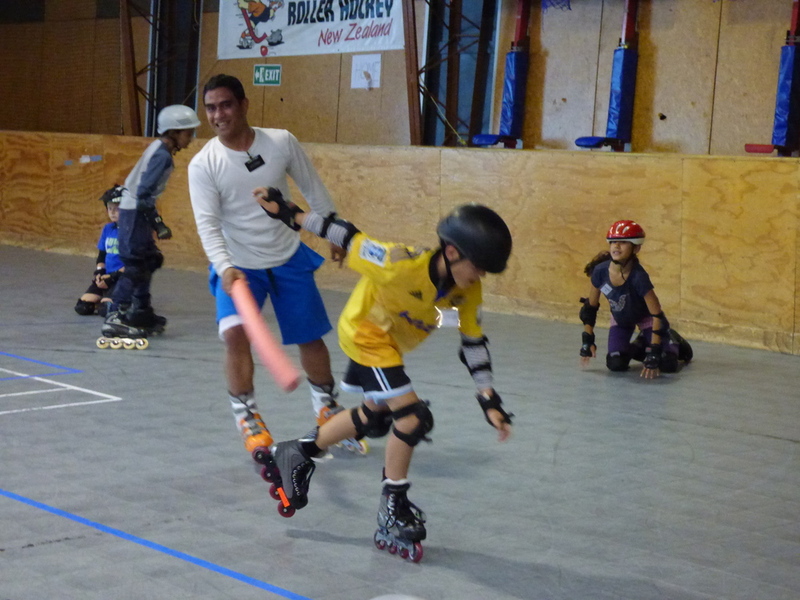 Cross-overs are hard to master but are a really important part of learning to skate. You will use them all the time to turn and to gain speed. You can now skate well enough to graduate to drills the length of the rink! Many thanks to today's SlapShot Coaches Martini and Jackson. Wahoo! We advanced to the hockey sticks today.